This show is dedicated to the bright memory of Valentin Streltsov. Retrospective includes artworks that were created over the last ten years with support of Valentin - my good friend, mentor and uniquely talented artist who passed away in December of last year. Valentin inspired my work through his vivid personality, profound knowledge and understanding of art techniques. He generously shared his resources and knowledge and these pieces would not look the same without Valentin’s input. Valentin has devoted much of his life to Byzantine Art. 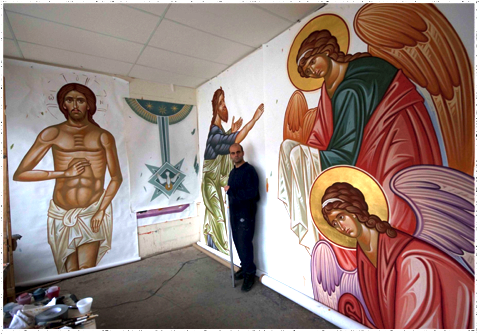 He has worked in Canada and abroad for the last thirty years painting icons for cathedrals. The use of centuries-old techniques and superior materials made his works excel in quality and beauty. Valentin’s intelligence and enthusiasm will not be forgotten and his spirit lives on through all those that he worked with and mentored throughout his life. I am grateful that I had the opportunity to enjoy his free spirit, sense of humour and creative mind.